This is it – can you believe it? We’ve reached the final week of our four-week routine challenge. Over the past three posts, we’ve learned about the importance of maintaining a daily routine for increased productivity, time management, and balance. We’ve established an effective bedtime routine so we get those important 7-8 hours of sleep a night. And we’ve created an efficient, realistic morning routine that carves out “me time” before the day officially begins. Today we finish the last leg of this journey by establishing a routine for our day-to-day tasks. We will discover different strategies to best manage our time so we accomplish our goals while also having fun. Are you with me? Let’s do this. 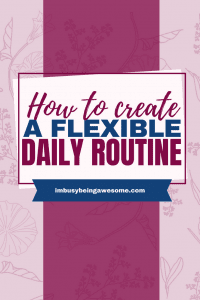 Rather, my definition of a daily routine is establishing a handful of daily tasks that help with efficiency, productivity, organization, and/or self-reflection. 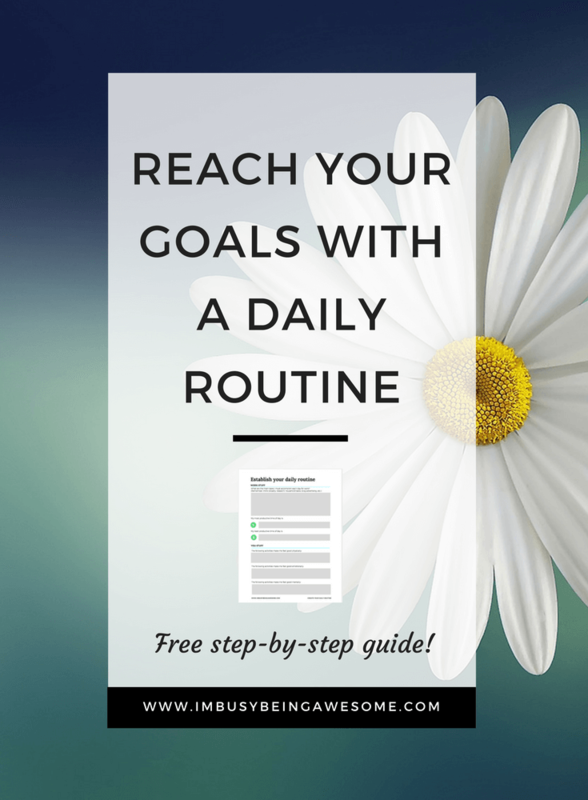 By turning to these activities with regularity, you create pockets of consistency in your life. This consistency, in turn, provides comfort and stability. 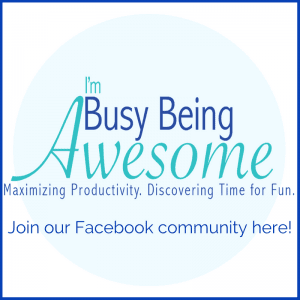 Occasional comfort and stability is incredibly beneficial for busy-awesome people like you and me. 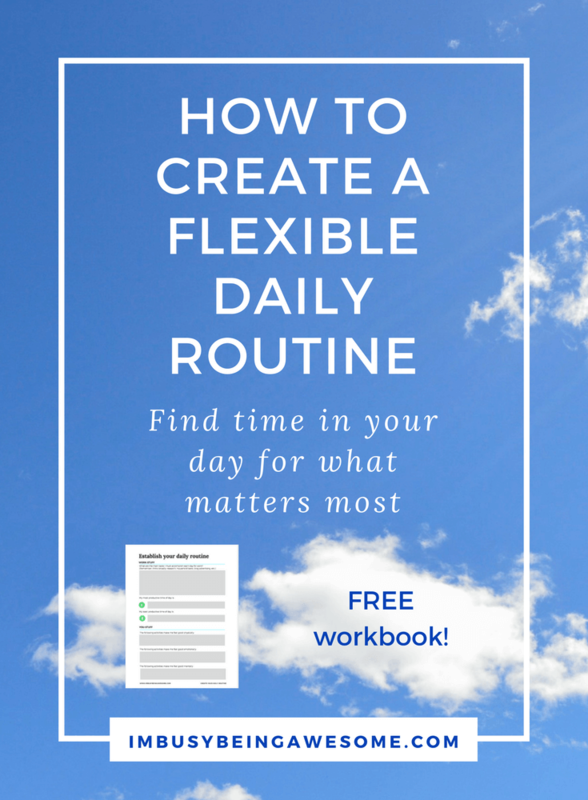 To create the perfect daily routine, I recommend coming at it from two different angles: the everyday “work stuff,” and the valuable “you stuff.” (Highly scientific language here, people). 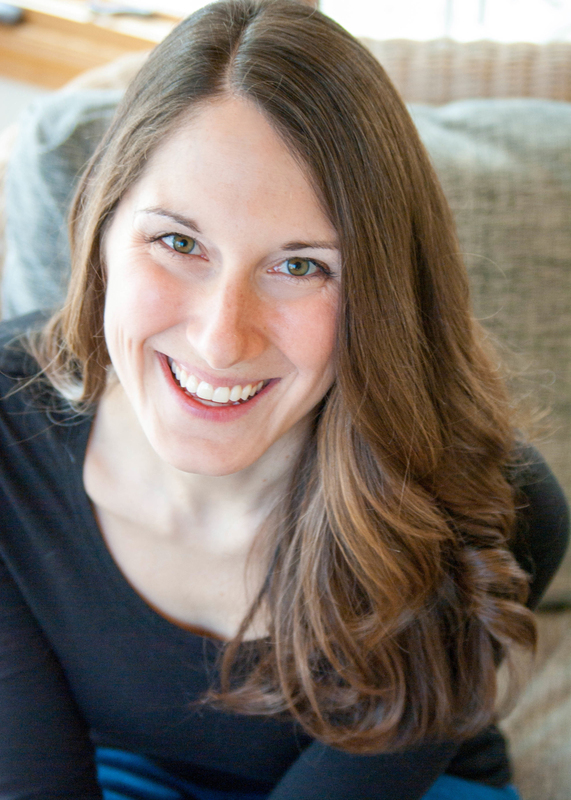 With the “work stuff,” I am referring to the tasks and projects you need to do for your job. Now, the word job holds many meanings here: it might be a regular 9-5 model, but it could also be a junior in college managing her classes, a stay-at-home-parent handling every detail of family life, or an entrepreneur simultaneously balancing several new projects. Wherever you fit in this spectrum, the “work stuff” category contains the things you need to do each day for your job. The “you stuff,” (aka the fun stuff!) is all about the things you need or want to do each day. And you want to do these tasks because they’re important to you, be it mentally, physically, spiritually, or emotionally. This “you stuff” category is no less important than the “work stuff” one. That being said, it often gets pushed to the wayside when life gets busy. This is precisely why I include the “you stuff” category in our daily routine process; it is important for our emotional and physical wellbeing, and it therefore deserves equal attention in our day-to-day activities. So how do we create our routine with these two different categories? Let’s tackle it step by step, starting with the workday. Before we start planning out the specifics, let’s first make a list of the regular tasks you do each day. This will look different for everyone, but the process is generally the same. Okay. I hear you. No problem. Try stepping back and looking at the bigger picture. You might not do the exact same thing every day, but I bet you do the same thing within a general category each day. Teachers, do you work on class prep each day? Business people, do you check in with clients each day? Bloggers and entrepreneurs, do you do some form of blog advertising/promoting each day? Stay-at-home-parents, do you work on household upkeep (laundry, dishes, floors, bedding) each day? By knowing what time you work the best, you will have an easier time setting your schedule. Okay, you know your list of general tasks, and you’ve highlighted your peak times of productivity throughout the day. Now it’s time to create that schedule. Look at your list of things to do. Keeping your peak productivity times in mind, begin planning your work routine. I recommend breaking your day into 30 minute or 60 minute increments with 5-10 minute breaks in between. Fill in the hours of your workday with your list of to-dos, and concentrate your most demanding tasks during your hours of peak productivity. Now, putting this approach in practice might feel strange at first, because you might not finish everything in one sitting. Instead, once you reach the end of your time block, take pride in what you accomplished. Then, move on to the next task. *Remember,* you don’t need to stress if you don’t get everything done in one sitting; you know you can come back to it at the same time tomorrow. Why? Because this is a daily routine. 10:20-11:00 Class Prep – office hours and review readings for the week. By knowing specifically what you need to accomplish each day, and what time you will tend to each task, you avoid wasting time wondering, “What should I work on next?” What’s more, by recognizing when you are at your peak performance, you increase your efficiency and get more accomplished each day. Okay, that’s the “work stuff.” What about the “you stuff?” What about the other hours of the day that you’re not at work? This is the fun part. For both your bedtime and morning routines, I’ve asked you to reflect on things you would like to do more often in your life but feel like you don’t the time. Guess what, I am going to ask you the same thing once again for your daily routine. What are the things that make you feel happy? Are there certain activities that help you relax after a long day? When do you feel most loved and at peace? Take a moment and look at your answers to the above questions. These are the things you need in your life every day. In order for you to keep going strong day after day with your ‘work stuff,” there must be time for YOU. Now, I realize it might not be realistic to fit all of your above answers in your daily routine each day. What makes me feel good physically? How can I feel good mentally? What helps me feel good emotionally? If you can tend to these three questions each day by fitting them into your daily routine, you’re on your way to one of the most important tasks of all: taking care of yourself. 7:30-8:30: Mental – Read: Catch up on my favorite bloggers’ latest posts. And just like that, you’ve established your ideal, flexible, daily routine. You get the every-day necessities done quickly and efficiently while – most importantly – saving time for what’s important to you. 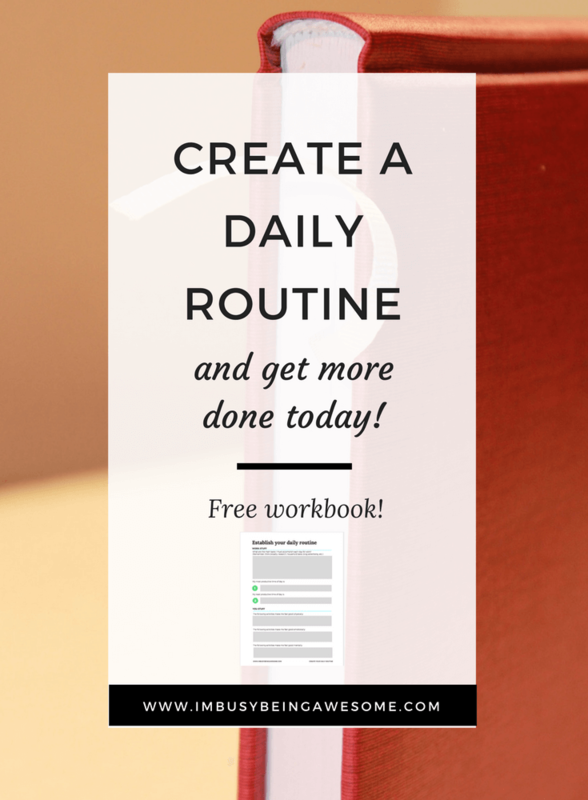 Are you ready to create your own daily routine? 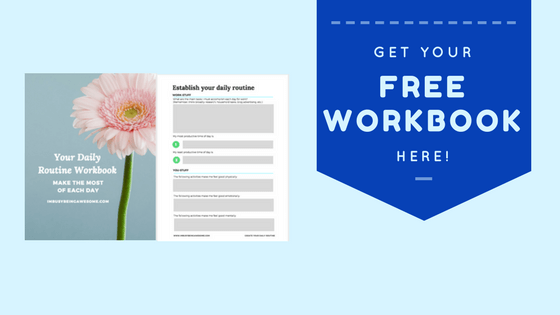 Download your FREE workbook here and get started TODAY! Are you looking for the other posts in this series? Check them out here! Have we connected on Facebook? 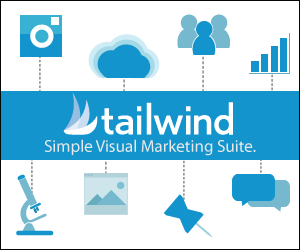 Click on the “like” bar at the bottom of the screen and get extra tips and strategies in your feed! I’ve recently started planning my whole days and it really makes a difference in my productivity. Planning the “me stuff” is really important to, it’s easy to forget about what I need. 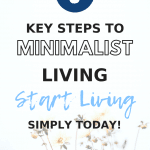 What a great post full of amazing tips! 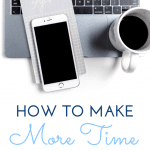 Between blogging and working a full time job, I’m pretty busy but I think this post will end up helping me a ton. Also, thank you for emphasizing the importance between you tasks and work tasks. So often I push aside fun things I want to do for work and I need to stop doing that. Thanks for sharing! I definitely need to create a more structured schedule for my days but I love your tips and your You List! LOVE this post so much!! 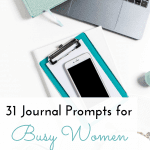 I have been in a major rut and have KNOWN I need to sit down and make a list or daily routine because I’m so much more productive that way. This post just 100% inspired me to get it together! Thanks so much for this note, Monica! I’m so glad the post helped 🙂 Good luck creating your new routine; let me know how it goes! Thank you for this advice. I definitely needed that! Great tips, Paula. I think we can all benefit from the reminder about recognizing our energy level fluctuations throughout the day and fitting in our activities to match. “Rhythm” is my word for the year…that helps me keep the focus on the flow of activity rather than the structured lists/agenda. I love that rhythm is your mantra – what a great word! The idea of focusing on the flow of activity is wonderful. Thanks for sharing that! I live for routines! I AND my family function so much better when we have a routine and stick to it! Especially during the work week! Daily routines are so helpful for productivity and it is definitely a good thing to schedule some “me time”. Great list! Totally needed this this monday! Thanks! Absolutely! I hope it helps. What a smart idea! As a work at home mom, I sometimes get to the end of the day and wonder what I accomplished. And I’m frustrated and exhausted! I need to work smarter and get into a good routine! I love having a set routine and I think I need to learn how to be a little a little more fluid with my routine!